That morning I just wanted to visit the San Rocco Oratory and I wasn’t expecting anything more. I reached it soon after the rain started falling, I looked at the opening hours sign on the door, I shook my umbrella to avoid dripping and I saw a man approaching. I entered and I noticed the man imitated me and shook his umbrella too. He asked an English information sheet. For a moment I was tempted to give him my card, thinking: one more reader for the blog. But then I thought: No, no stalking. The day before, strolling in town, I had noticed a young couple staring at their tourist guide map and I stopped to help them. Same thing. For one moment I was about to give them my card and tell them: “I have a blog. Please, help me spread the word… I’m kind, you see?” I didn’t, of course. I avoided the stalking and I only helped. Who knows, maybe one day they’ll find my blog, and maybe they liked Padova more because of me. 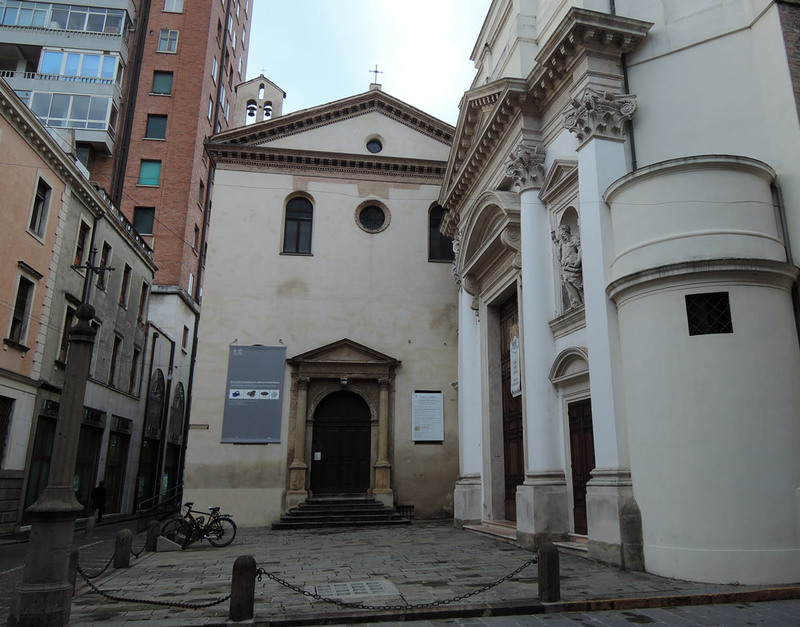 The San Rocco Oratory dates back to 1525 and it was intended to host the meetings of the chapter house. The ground-floor is completely decorated by frescoes. It surprised me. What an unexpected beauty! I honestly had no idea that this little oratory could hide such paintings. There was a contemporary jewels exhibition going on, “Ori entamenti e altro” (some sort of wordplay: ori is the plural form of oro, gold and orientamenti means orientations). Two women were there. One of them approached me and asked me if I wanted some info… She seemed eager to explain the artworks. I noticed she was wearing some exquisite jewels: a bracelet, a ring and a brooch. So I openly asked her: “Are you one of the artists?” “Yes”, she replied (she was Fernanda Duso, see below). So we came to terms 😉 . First I enjoyed the frescoes on my own, and then I took the opportunity to learn more about the jewels on display thanks to her. If you want to follow the San Rocco story on the walls you must start from the north, on the right of the Altarpiece, which is Madonna with Saints by Maganza. Prayer of the parents by Domenico Campagnola. Giovanni and Libera, parents of San Rocco, pray the Lord to give them a child. San Rocco in Rome and Retreat in the wood by Gualtiero Padovano. San Rocco was struck by the plague and decided to retreat in the woods, refusing medical care. San Rocco in front of the Pope by Gualtiero Padovano. This is one of the best frescoes of the Oratory. Vision of the Angel and Sleep of San Rocco. These two frescoes refer to the wood retreat period. San Rocco prays the Lord to heal him. An angel appears to announce him that God granted his request. After the sleep the Saint will be healed. On the background you can see Padova: the walls, St. Giustina Basilica and St. Anthony Basilica. Simonetta Giacometti uses recycled materials to create original peaces: plastic bottles, eggshells, jeans studs. Bernadetta Ostani blends architecture and goldworking: enamel, copper, gold and gemstones to give new life to ancient family jewels. Fernanda Duso is primarily a painter. She presents some raku ceramics works along with jewels focused on the relationship between solids and voids. The fourth artist, whom Fernanda referred to as “my maestro”, was Giorgio Cecchetto. In response to a unpleasant personal experience he decided to present a series of works very different from his ordinary production, as a reflection on human condition. The exhibition will last until June 26th 2016. The artists will be available to accompany visitors on Wednesdays and Fridays afternoon from 3.30 to 7 pm. I guess I was lucky, since I went there on a Thursday morning! Fernanda explained to me that on the second floor there are other two frescoes and an exquisite reredos. Sadly the artworks are not visible because the staircase is damaged (since 2012 Emilia Romagna earthquake). If you’re in Padova and you want to see beautiful frescoes, original jewels, and besides for free, well… just go!